The Northeast Mississippi Community College softball program could not overcome a slow start to its postseason opener despite a very strong finish to the contest against its archrival. Itawamba Community College scored six runs in its initial at bat and held on to defeat the Tigers by a 7-4 score on Friday, April 27 in the first round of the Mississippi Association of Community and Junior Colleges (MACJC) State Playoffs. The Indians lead the best-of-three series by a 1-0 margin. Game two is scheduled for 1 p.m. on Saturday, April 28 with game three to follow immediately, if necessary, at the ICC Softball Complex. Itawamba, which is ranked No. 3 in the latest National Junior College Athletic Association (NJCAA) poll, tallied each of its seven runs and recorded six out of nine hits in the first two frames of the contest. Macey Cox, Meg Sullivan and Hannah Williams each had RBI singles for the Indians while Madison Carnes had a bases clearing double in the first. A throwing error by the Tigers allowed Itawamba to take a 7-0 advantage after two complete innings. But Breanna Tarpley settled in from that point and gave the Tigers a chance to stay in the matchup. She posted four consecutive scoreless frames in the circle and left four Indians stranded in scoring position. Tarpley (7-4) was the hard-luck loser for Northeast after conceding only two earned runs. She went the distance for her eighth complete game of the campaign with three walks and five strikeouts to her credit. The Tigers (26-20) responded in the third with a two-out rally. 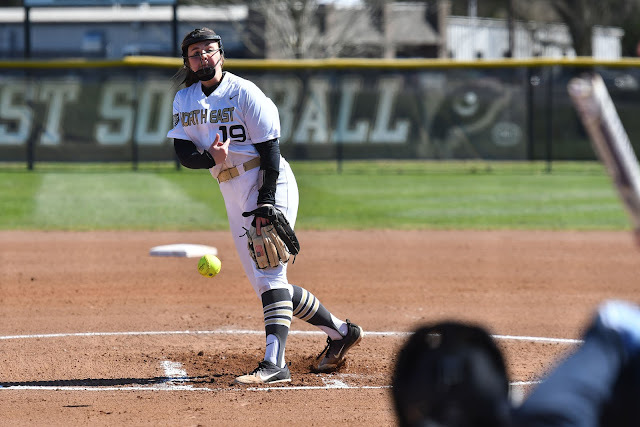 Austyn Holden got things going with a walk and then came home one better later when Caleigh Wallace sent a double into the left-centerfield gap. It was the 25th extra base hit of the year for Wallace, which is tied for the most on the team alongside Tianna Castillo. She extended her new program record for most RBIs in a single season to 46 as well. Following an error by the Indians, Shaquera Wilson scored Wallace with a RBI single to the left side. Tarpley helped her own cause moments later with a single past a diving shortstop that brought in Castillo and Wilson. Northeast got at least one base runner on in each of the following innings, but could not scratch another run across as Delta State University transfer Bailie Springfield (19-3) earned the victory for Itawamba (38-7). The Tigers brought the tying run to the plate in the seventh after Wallace and Castillo connected on back-to-back singles. However, a strikeout and fielder’s choice ended Northeast’s final threat of the matchup. Northeast had seven hits with Tarpley and Wallace accounting for four of them. Both squads made two errors defensively while Paige Dill stole her team-high 22nd base of the campaign for the Tigers. The winner of this series advances to the 2018 MACJC State Tournament, which will be held next weekend at the highest remaining seed after the opening round of the playoffs is finished. Northeast Mississippi Community College pitcher Breanna Tarpley tossed four straight shutout innings and only game up two earned runs, but received a tough-luck loss in a 7-4 decision at Itawamba Community College in game one of the first round of the Mississippi Association of Community and Junior Colleges (MACJC) State Playoffs on Friday, April 27 in Fulton.